THIS Thursday, the Monetary Policy Committee (MPC) will meet to decide on the overnight policy rate (OPR). After the November meeting last year, during which the committee hinted at a more hawkish stance on interest rates, many do not doubt that the OPR will be raised this year. Nevertheless, Bloomberg data shows that economists are divided on whether interest rates will be raised in the first quarter. After it meets on Thursday, the MPC is next scheduled to convene on March 7. Of the 24 economists listed with a forecast, 14 have pencilled in a rate hike of 25 basis points for 1Q2018 while the remaining 10 expect the status quo to be maintained. But will higher-than-expected crude oil prices — now hovering close to US$70 per barrel — push the central bank to raise interest rates to curb a potential cost-push inflation scenario? Economists believe such a scenario is not a concern at this juncture and expect inflation to remain manageable throughout the year. Instead, they believe a rate hike will take place due to steadier economic prospects. “The rise in Brent crude in recent weeks has been partly mitigated by the stronger ringgit. This has helped keep fuel prices at the pump stable in the first half of January. Based on our estimates, we think that even if Brent crude edges up to US$75 per barrel while USD/MYR stays in the range of 3.90 to 4.00, RON95 prices can still hold below the RM2.50 level, assuming there is no government subsidy,” says UOB (M) Bhd economist Julia Goh. According to Socio-Economic Research Center (SERC) executive director Lee Heng Guie, Bank Negara Malaysia considers several factors in the assessment of an appropriate monetary stance, namely the strength of the economy, domestic demand conditions and inflation expectations. He adds that the central bank is not compelled to act if cost-induced inflation is perceived to be transitory in nature. That said, he believes that domestic economic conditions are ripe for Bank Negara to consider raising rates by 25 basis points to 3.25% this week. “It is a move that appears all set to restore the level of monetary accommodation given firmer economic prospects. The interest rate level will not significantly discourage consumption and investment, while encouraging savings,” he says. Goh also expects the OPR to be raised to 3.25% this week. She adds the market could already have priced in a rate hike, given that the ringgit has strengthened over 5% since the last MPC meeting in November. The ringgit is trading at 3.94 against the greenback. She comments that the rising crude oil price is an indication of stronger global economic growth and demand. “I believe the recent gains in global oil prices are due to a combination of demand improvement coupled with supply restraint. The demand improvement would be due to the broadening of global growth that has positive spillover [effects] on Malaysia’s exports, investments and domestic economy. “Thus, this provides a basis for Bank Negara to raise interest rates sooner rather than later,” she says. On the other side of the divide, Affin Hwang Investment Bank Bhd economist Alan Tan sees the OPR remaining unchanged at 3% when the MPC meets this week. Any upward revision may come in the middle of the year, he says. Tan’s rationale is that domestic demand will support growth this year as export growth is expected to moderate. The central bank has the flexibility to wait and monitor the strength of domestic demand before raising rates this year, he adds. “The US Federal Reserve will likely raise interest rates three times this year, but the interest rate differential still favours Malaysia,” he explains, adding that he has only priced in one rate hike of 25 basis points for 2018. Meanwhile, some quarters are of the opinion that the OPR will only be raised after the general election, which must be called by August. AllianceDBS Research is among those with that view. 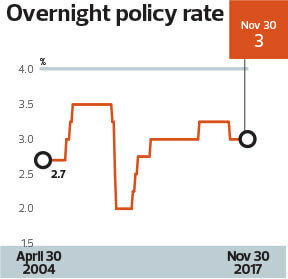 The research house mentions in a report that Bank Negara could hike interest rates either by March or May, depending on the timing of the 14th general election. Maybank Investment Bank Research also believes any OPR hike will be a post-election event. “Given our view of a post-election OPR hike by Bank Negara, and our expectation that the 14th general election will be held within the February to April ‘window’, our eyes are on the May 10 MPC meeting as the earliest timing for OPR hike,” it says.